Astronomy and Geology: Consider reading our Genesis 1 concerning the creation of our Solar System with all its planets, dwarf planets, moons or satellites, comets, meteoroids, and asteroids and see the article below. A Sample of a Recent Mini-Dwarf Planet or Spherical Meteorite Found one summer in about A. D. 2000 at Camperville, Manitoba, Canada. It is the size of a beach ball of about 15 inches/38 cm. in diameter and has a weight of about 162 pounds/101 kg. This photo was taken April 24, 2004 by Cliff Besson This mini-dwarf planet is simply a spherical rock meteorite. Until this spherical rock was seen flying through the sky by three or more people plus many of the dogs in the area and landing in a field, the experts on spherical rocks had no sensible reason for their existence or explanation for their origins. They called these near perfect spherical rocks concretions because they were rocks that were hard like concrete. This rock meteorite was found in a field within twenty-four hours after a Ronald Chartrand told his friends about seeing it falling out of the sky into a field in Camperville, Manitoba. The man that found it, found it in the field just across the road where he grew up and were his mother was living and may be still living at this moment. Constable Paul Sutherland, who found it, knew that it was never there before, because he played and hunted in that field for years, since he was a child. In other words, it is not an Indian artifact as Paul Sutherland is an aboriginal himself. There is another one, almost exactly the same size that was found a year or so earlier by a landscape contractor on the Pine Creek First Nations land, across the road from that same field, but a few miles away. Many so-called concretions, mini-dwarf planets, or spherical rocks have been found throughout the Earth but astronomers and geologists have been indoctrinated so much by their professions that it is very hard to convince them of the real origin of their concretions. Most professionals are proud of their realm of expertise and knowledge, which they gained through attending numerous hours of lectures and studying many text books on subjects in their profession. The trouble is though, they often believe everything they are told, like many people of pagan religions and of religions of America and of Canada. These above mentioned professionals appear to have a like religious faith concerning everything their professors or instructors have told them, believing everything to be the whole truth when some or even much of the information they were told were just unsubstantiated guess work. It could be that some may want to believe that the spherical rock concretions are really meteorites but they would likely be fearful of being ridiculed by their peers or fellow professionals. 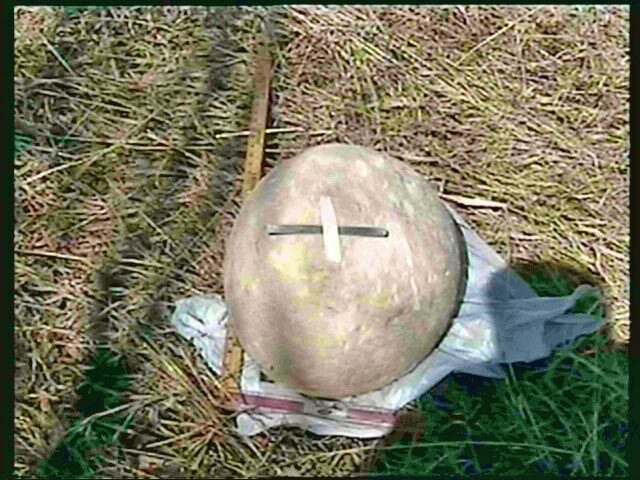 These so-called experts have such a religious faith over the accuracy of their profession that it might take one or more of these spherical-rock mini-dwarf planetary meteorites to fall through the roof of one of their universities or into one of their yards, in the site of many people to get them to finally realize the origin of these spherical concretions. If necessary, I pray that one will do so shortly. Just last month in September 2007, one professional truck driver of about thirty years driving, saw for the first time, a round spherical like object flying past his truck into a wooded area off to the side of the highway. It was going in the same general direction that he was going, east or south-east towards Thunderbay, Ontario. 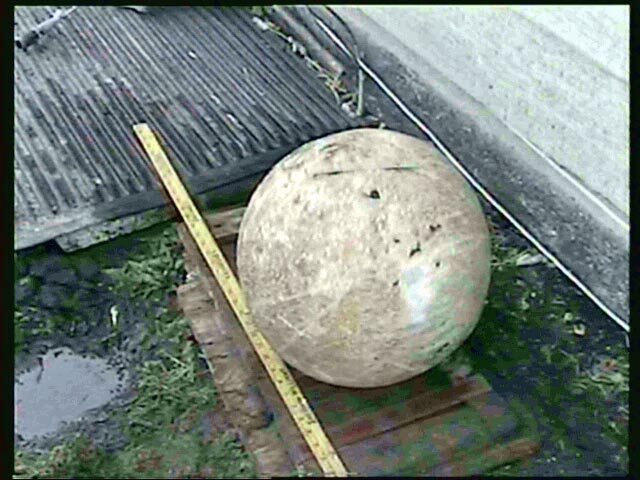 It had a white tail of possibly thirty feet long and the object seemed to be about a foot and a half in diameter, like the one pictured above. It was night time and the driver was on the job so he could not stop to try to find it. If he did look for it and found it, would it not be still in a spherical shape as he saw it flying through the air unless it exploded before impact or upon impact with a rock? A few years ago, in 2004, about twenty people saw a similar flying object pass over their heads. It appeared to be of similar size but it only had a tail of about three feet long. It also seemed to be flying about thirty feet above their heads and may have landed in one of the many forests in that area near Camperville, Manitoba, Canada. Now if one or more of these people found that same object after it had landed, what would it look like? Would it not be spherical in shape as they saw it flying in the sky? Draft Copy of new book on Solar Big Bang: When? Click on this link: client/Truth and Light Mini AF0MEE/SolarBigBang 4c.pdf and /client/Truth and Light Mini AF0MEE/Mutual Origin of Ten Comets b.pdf. When the above book is finally in print, hopefully in a few weeks, the above links will be removed. of the following tables and columns. year B.C. of the Big Bang. Note: one (1) AU = mean or JetPropulsion Laboratory/California Institute of Technology. the sun and the Earth. 98% or more of our comets that are orbiting in and out of the regions of neighbouring planets. is, according to these C/1996 would be 90.795 years. 28946 days or 79 years. before 2014 to one or more planets or satelites of them. set of comets in Column R.
the above is 16 days later or October 17th (note this from. No part of this book may be reproduced or transmitted in any form or by any means, mechanical or electronic, including photocopying, recording, or by any other information storage and retrieval system, without permission in writing from the publisher, except for brief quotations used in connections with reviews in a magazine, newspaper, or newsletters. In other cases a few lines, like up to eight of them of our print or article, may be printed or saved. Acknowledgment must be made at each quotation to our publisher, T and L Research or to the author with notation of our address and phone number. and to lovers of astronomy. This whole book is on determining precisely when there could have been a solar big bang strong enough that could have brought about all the meteorites, spherical rocks, and ten comets that are flying around in our solar system. First of all, let us consider that there are many theories as to the origin of comets, meteorites, meteors, asteroids, and other objects or bodies that make up our Solar system. This author though has not been satisfied at all with the regular explanations given about them, especially on the make up of comets “as dirty snowballs.” Nor does he agree on the prevailing theories on the origin of meteorites, and of numerous spherical rocks that have been found around the world. He therefore read much about them and tried to make some sense of everything pertaining to them and this world that we are living in and especially the wonders of the seeable universe about us. With some help and much thought, the author came up with a theory on the mutual origins of comets and of spherical rocks. As a supplement to this paper, an earlier work on the origin of spherical rocks is also included to help prove the mutual origin of smaller rocks and ten comets. Please examine the spreadsheet work to see how he determined the origin of comets and of spherical rocks and to find out the amazing results. This author has been interested in astronomy from the time he was a teenager, which was more than fifty years ago. During these many years, he has wondered and studied about the makings of our solar system, of comets, and of meteorites. Because of the news media interest in comets around 2002, this researcher therefore returned to his teenage interest and love of astronomy. Shortly after this renewed interest, while talking to friends in Camperville, Manitoba, Canada, about comets and meteorites, they mentioned that two rocks, about the size of beach balls were found in their area during the previous few years. Shortly after that, this writer located, viewed, weighed, measured, and tested the rocks for iron or nickel content with a compass. Later on, they were also analysed by staff at the Universities of Brandon and of Winnipeg in Manitoba. This writer also tried to get one or more astronomers of the University of Manitoba to check out these spherical space rocks but they refused to believe that they were actually rocks that had fallen out of the sky. Are you trying to tell me that I am ignorant and gullible while you are smart? The nerve of you to say that. Whom do you think you are? Are you also saying that my parents and forefathers and all my friends at church are also ignorant and gullible, believing lies? You yourself are the stupid, naive, and crazy one. Look, thousands of our preachers and even millions of people in my religious denomination cannot all be wrong, so you Mr. Besson must be wrong. Blind: 4. not having or based on reason or intelligence; absolute and unquestioning: She had blind faith in his fidelity. As it is with religious people described above, most people in some of the sciences and arts just parrot words off what they learned from their past teachers, professors, and text books had taught them, not questioning those beliefs, philosophies, or theories. When this writer took his ideas to three universities concerning comets and meteorites, he found that their beliefs were quite different from what this writer was finding out in the field of investigation of eye witnesses. A booklet was prepared on the rocks that he was informed about and got to see but it is now out of print and is in need of revision. There was an error or two plus he needed to list more names of people who saw the most recent one falling out of the sky. So with this stirred up interest in astronomy and geology, more spherical objects were soon pointed out to him. These were noted to have been found by others and then examined by this researcher. On trying to understand the nature of these found objects and their formation or origins plus that of comets, a theory was developed as to how they all may have come about. He then worked out a way to try to prove his theory that comets came originally from a massive explosion on the Sun. This paper therefore sets out to do this very thing by going back in time to when a number of comets all seemed to have been at our Sun at the same time. He first matched up comets of similar Astronomical Units (AU) when they were at their perihelion or closest part of their orbits to the Sun. Secondly, he then worked out the time periods of as many matched up comets as he could find. At that time it was only ten. This was in about the year 2002. Thirdly, he then experimented first on graph paper, yards (or metres) long, to try to determine when and if the ten comets were ever all together at the Sun. Fourthly, on using a computer spreadsheet program he came up with some amazing results using these comets (shortest periods to longest along with their AUs): Halley (last seen in 1986) @0.59, Ikeya-Seki (1965) @0.006, Great January of 1910 @0.11, Great Comet of 1901 @0.25, Bennett (1970) @0.52, Great Comet of 1861 @0.82, Coggia (1874) @0.67, West (1976) @0.20, Hyakutake (1996) @0.21, Hale-Bopp (1996) @0.92.
out 76.7230080585249/2 years which = 38.36150402926245 years. This was worked out with the strong gravity of our Sun tried to pull them all back into its control and its huge hot mass of liquid rock of minerals and every element that can be found in all the meteorites that land on our planet Earth. The comet Halley got away for about 76.7230080585249/2 years which = 38.36150402926245 years. This was worked out with the consideration of twenty-seven (27) of its orbits, going back to records of its passages in time to 2071.5212175801723 years before February 9, 1986 in 87 BC on August 6. Please see the end section which has a spreadsheet program that shows how this was done. On working out his theory, that most, if not all found spherical rocks and present day comets came from a super explosion on our Sun, thousands or more years ago, he examined and studied the article: Great Comets in History by Donald K. Yeomans of the Jet Propulsion Laboratory, California Institute of Technology. A number of other records of comets were also studied to see if there were any indications of the periods of their orbits (such as the length of time it takes to come back to its same point in its orbit around the Sun, such as its closest point to the Sun, its perihelion). In other words, he wanted to see if the same comets that were just seen lately were also seen before. For example, the famous Comet Halley, according to Yeoman’s article had perihelions of 0.58 or 0.59 AU (the mean or average distance that the Earth travels about the Sun). In 1986 though, its orbit was worked out more precisely to about 0.587 AU. So in any ancient records of comets being at a similar distance from the Sun, at their closest part of their orbit before they zoom out, like a boomerang or yoyo into space again, may be that same Comet Halley. So it should be with other comets mentioned in Yeoman’s history. Therefore, on searching through Yeomans’ list of comets, ten pairs of similar perihelions were figured out and noted but there were six comets that could not be matched up. We have listed them as well in our spreadsheet program, in case the periods of their orbits could be worked out later on. To then test out the theory that all our present comets and meteorites were once part of the Sun and came from an explosion on the Sun, the periods of each of the ten comets were then worked out back in time to hundreds of years before Bishop Ussher’s estimated year for the Biblical creation of Adam and Eve, that of 4004 B. C.
Since the above calculations were made an eleventh comet and its period of its orbit has also been worked out. This one though, will be considered in a future publication. As almost all the elements found on Earth have also been found to be in the Sun, through the analysis of Sun light (67 of them), what we find on Earth could have come from the Sun or from the same material from which came the Sun. So please consider the following pages as possible proof of the real origins of the listed comets. On considering any explosion strong enough to eject those ten comets millions of miles/kilometres into space, then most likely our presently found meteorites and spherical rocks were also expelled at the same time as the comets. Photo 1. 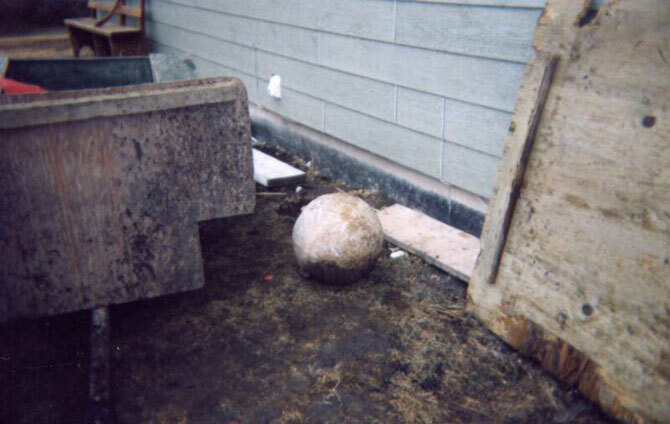 Spherical rock found in Camperville, Manitoba, Canada. It is alongside a yardstick. Throughout the world, many spherical or globular rocks have been found but geologists have not been able to agree on how they may have been formed or how they originated. Well, a few years ago, one meteorite was said to have been seen falling from the sky into a field in a forested area on the outskirts of Camperville, Manitoba. This writer on talking to people about four or five years after it fell out of the sky, was told that this rock in the above picture was seen falling down into Camperville at about four a. m. while others said it occurred sometime after dark on the night before it was found. Another meteorite was seen slowly flying across the sky by a number of people, south of the same village but was not found because of the forests all around that area. Two other ones, about 6-8" (152.4-203.2 mm.) were found as well, but they started to fall apart after being kept indoors for a year. These clues have therefore helped immensely to understand the origins of spherical rocks, for each one of these rocks that were seen were said to have been spherical. These days, a number of people have been seeing objects falling out of the sky. On Saturday, 23 April, 2005, during the daytime, about fifty or more people reported seeing and/or hearing a meteor explode overhead in the sky near St. Ambroise area of Manitoba, north of Portage La Prairie. It is thought to have been about the size of a suitcase. Scientists would like to be able to find at least a chunk of it. See one story about this sighting at http://winnipeg.cbc.ca. In the following chapters we will try to prove beyond a shadow of a doubt that most ancient spherical rocks found on our planet are not man made but were naturally made in space and not on the Earth. It should be realized than any hot or liquid metal like mercury becomes spherical when it falls away from its container and when on the floor, it rolls around like a ball bearing or bb from an air rifle. So does hot molten iron which sometimes flies away from the area which is being welded. The same thing applies with regards to molten rock being ejected from volcanoes or from the Sun. Chapter Three: What are Meteorites? Perhaps we should first answer the question, “What are meteors and meteorites?” Well, we are told that meteorites are rocks that were “ejected from an asteroid or planet by the collision of another meteoroid or asteroid.” Has anyone seen this happen though? Has any scientist seen a collision in space as mentioned and then seen the debris fall onto the Earth immediately after or even years later? We have never known of anyone lately seeing such things. Have you? The ancient Book of Jasher though, at chapter VIII:2 has this account of one star [or comet]. It “came from the east and ran in the heavens, and [it] swallowed up the four stars [illuminated objects, small moons, planets or comets] from the four sides of the heavens.” This happened on the night that Abram was born (VIII:1). But there was no mention of seeing any debris falling in their area of the city of Shinar [possibly near Babylon]. Another question though, if the meteorites came from the asteroids, from where did the asteroids come? Perhaps they came from a similar collision that was noticed by the wise men and conjurors of Nimrodon that night when Abram was born? This was very likely in 1939 B. C., five hundred years before the Exodus of the Hebrew slaves from Goshen in Egypt in 1439 B. C.
That above mentioned collision though, may have been the very one that brought about the tens of thousands of pieces of debris that formed the asteroid belt between Earth, Mars, and Jupiter. Former research physicist Stan Deyo of http://www.standeyo.com said on 17 May 2005, on The Power Hour short-wave radio program that the number of asteroids in the belt between Mars and Jupiter are probably the equivalent of an object about one quarter the size of our moon. Could it be that there were such objects that size that may have broken apart in a big collision in space? Maybe it was that very collision that was observed on the night that Abram was born? We were told that the Shoemaker-Levy 9 comet that smashed into Jupiter in July 1994 had already previously broken into at least twenty-one fragments that were up to two kilometres in diameter (www.jpl.nasa.gov). Most likely those fragments were pieces of debris from an explosion or collision in space one day. They just so happen to be all going in the same direction as the main body of the comet. Examples of this can be seen in areas of the world where there are fields of spherical rocks such as in Cannonball North Dakota and in places in Central America, mentioned later in this book. Upon circling the planet, all these pieces apparently, remained grouped together until impacting the planet in about twenty-three different places. The impact is said to have been the equivalent of about 200 million megatons of TNT. Surely a comet this size, hitting a small moon-like object, one-quarter the size of ours would have caused sufficient damage to perhaps smash it into thousands of pieces. Most likely though, the meteoroids anywhere in space are really just left over debris from one or more huge nuclear explosions on their closest parent stars.After the explosions, they would fly around in orbits like our planets, comets, and asteroids. They generally would only fly around the star from which they got expelled and would mostly be found within or close to the same plane as the orbiting planets of their stars. The planets of our Solar system and possibly of other planetary systems are generally all spread out in a plane perpendicular to the equator of the parent star. Most of them, also circle the same star in the same direction as the rotation of its gasses, fluids, and any black or dark “sunspots” that regularly form near the equator of the star. The Sun is the central massive main body of our Solar System, the area of the Universe where we reside. Scientists say that it is a dwarf star, about 4.5 billion years old and on the outer area of the Milky Way Galaxy. It “was formed from material that had been processed inside other stars and supernovas.” It has a radius 108.97 times that of the Earth. This writer believes that our sun came from an explosion from the central body of our Milky Way Galaxy, possibly 30,000 years ago to a million years ago. The photosphere is “the luminous visible surface of the Sun,” the next layer is the chromosphere, and the corona is the outer atmosphere. The sun spots seem to be indentations on the surface, in other words they are probably of heavier matter. The Sun does rotate every 27 days at its middle . . . . it rotates about every 35 days near its poles. When explosions happen on our Sun and on stars, any matter that gets expelled far enough and fast enough above their surfaces get exploded into orbit. The same thing happens on Earth when mankind shoots rockets, with tremendous explosive power straight up or to the east and very high into space, they end up going into orbit around our planet. 1,445.22 miles per hour (see below) in an anticlockwise motion as seen from the north. So when a super huge nuclear explosion occurred in the past history of our Solar system, the mass, blobs, and spittle of molten soupy matter from the lower and upper plasma and gaseous atmospheres went up and mostly into orbit in the same direction they were going It is the centrifugal force of the expelled objects travelling around the sun, seemingly trying to speed away from the parent body but at a certain time of its travels the forces of gravity from the sun and its centrifugal force balance out. The object then remains locked in that same orbit until something gets in its way or comes close enough to it, to slow it down or speed it up. It will then change its orbit closer or farther away from the Sun. This often happens to the smaller objects in space, like the comets, especially with Comet Halley. Its period of an orbit has varied at its perihelion from 74 years 324 days to 79 years 91.9 days. while on the sun. Most likely all the biggest explosions on our Sun occur in sunspot areas on or near its equator. The escape velocity is said to be 618.02 km/sec (384.01 mi/sec). In other words, any matter that gets exploded from the Sun’s surface faster than the above figures can escape the very strong gravity of the Sun and goes into short to very far distant elongated orbits like with comets. Every object in our solar system has a perihelion (closest distance of its orbit around the Sun) and an aphelion (farthest distance of its orbit from the Sun). This illustration is from Random House Webster’s Unabridged Dictionary (for computers), Random House, ©1999. At times, some objects slow down enough by getting too close to another orbiting body that they no longer can stay in orbit and get pulled back down into the Sun and disappear. The Radius, diameter & circumference of our Sun is as follows: “The sun is nearly a perfect sphere. Its equatorial diameter and its polar diameter differ by only 6.2 miles (10 km). The mean radius of the sun is 432,450 miles (696,000 kilometers), which makes its diameter about 864,938 miles (1.392 million km). You could line up 109 Earths across the face of the sun. The sun's circumference is about 2,713,406 miles (4,366,813 km). It is very likely that it is from some of these sunspots that there are huge explosions. The sunspots build up on the equator of our Sun and very likely on the equators of other stars. Apparently the under surfaces of the sunspots can overheat too much and cause explosions and flares. They are caused by intense magnetic activity, which inhibits convection by an effect comparable to the eddy current brake, forming areas of reduced surface temperature. They usually appear as pairs, with each sunspot having the opposite magnetic pole to the other. Sunspots do not appear in random locations. They tend to be concentrated in two mid-latitude bands on either side of the equator. They begin appearing around 25 to 30 degrees north and south of the centre. As the solar cycle progresses, new sunspots appear closer to the equator, with the last of them appearing at an average latitude of 5 to 10 degrees. Sunspots are almost never found at latitudes greater than 70 degrees. sunspots. As it reaches the close of a cycle, new sunspots appear near the equator, while a new cycle produces sunspots in higher latitudes. The cycles overlap; sunspots from the previous cycle can still develop even after sunspots from the new cycle appear. So solar scientists have a very difficult time saying exactly when one cycle ends and the next begins. As it was earlier found that explosions of solar flares occur near sunspots and that any future dangerous explosions could affect our Earth’s electrical power lines, as has happened in the past, we will consider this topic of sunspots further. We will consider old records of sunspot activity and other records that could have been referring to sunspot activity. Furthermore, sunspots activity may be the source or engine for propelling meteors and comets into space. Then there is the strange phenomena of a double dawn which occurred in China: "In the first year of KingYi (of W. Zhou) the day dawned twice at Zheng," In articles on this strange phenomena, the astronomers have made a bad guess as to the timing of this event. This whole phenomenon would have naturally happened around 4:30 a. m. in China, when the moon would have gotten so bright it seemed like the Sun was shining. After a short while the moon went back to normal brightness and then the real Sun arose as usual at about 7 a. m., making it look like a second dawn had occurred. An explosion on the Sun, as described by its brightness just mentioned must have sent thousands of tons of molten rock into space. Whether it launched some comets as well, who can tell? This is just mentioned to indicate that huge explosions have occurred on the Sun and could happen again. As of early 2011, solar cycle 24 was under way, headed toward a peak of activity expected in 2013. As the Sun is said to have a diameter of about 864,938 miles (1,391,685 km) and as sunspots revolve around its equator in about 27 days, then they travel about 100,496.5 miles/161,698.9 km per day and 4,187 miles per hour or 6,737 kilometres per hour. Therefore when a big enough explosion happens on the sun much of the molten matter could end up rotating the sun in an orbit like a short or long period comet. per hour speed of anything at our equator, as the Earth spins eastward. On doing it this way, it therefore takes less energy to put anything in space near the equator. With regards to us on Earth, people usually see the meteorites first as “shooting stars” or meteors flying quickly or slowly across the sky. Occasionally some are found shortly after they fall but most often they are never found. Once they are found, the landed meteors or meteoroids are then called meteorites. As discovered by two people we will mention later, some meteorites break down to small particles or grains upon being exposed to heat and moisture, as found in homes or out in the outside elements. This therefore accounts as to why not many spherical meteorites are found intact, if not found right away. Sometimes the smaller explosions on our Sun are just seen as solar flares and coronal mass ejections. An explosion that would be great enough to cause sufficient mass to be ejected to form a number of huge objects as in our solar system would have to be much greater. One would likely have occurred as a super-nuclear volcanic-like explosion from way beneath the surface of the Sun or stars. Explosions such as these would likely have occurred hundreds or thousands of miles beneath the liquid, gaseous, and plasma surfaces of the stars, because of the ejection of all kinds of elements into space, from the lightest elements to the heaviest known elements. When one considers the numerous different shapes of galaxies, especially the pin wheel types, those shapes must have been caused by two or more huge explosions on different areas or opposite sides of the central huge bulge of the star of those galaxies, not necessarily at the same time though. Even our Milky Way galaxy must have come about by a huge explosion to drive our Sun and its neighbouring other stars into orbit about its centre, which must have been spinning around very rapidly. It follows then that our own star, our Sun, most likely had its own day of a time when things got too hot and a huge explosion developed. By the fact though, that our Sun as well as all the other nearby stars of our galaxy are travelling at great speeds around the central star and core of our galaxy, the explosion must have been close to the spinning equator of the parent star. Most likely the rings of Saturn were also caused by a huge explosion while it was still hot from the explosion from off our Sun. That explosion must have also occurred on or near the equator of that planet. Is this not logical? It therefore follows that if our Sun is fifteen or 4.5 billion years old or whatever age it really is, then all matter that gets expelled from this same Sun or star goes into orbit about it with the same age as its parent. This is so, even if a planetary formation just got formed, let us say, only about one hundred thousand years ago. Its material would still be of the same age of the star that created it, though the planets themselves only got into those spherical-like shapes, let us say, one hundred or more thousand years before, when they blew off from their parent star. When these super huge nuclear explosions occur, not only do they expel enough mass to form planets but also all their satellites or moons, the comets, asteroids, meteors, shock waves, light, and radiation. With regards to any meteorites that are found on our planet, most likely every one of them has come from our own star, the Sun. About three hundred years ago, in England, numerous stones from the heavens fell on a village in the daytime. Lately, one fell through the roof of a house in Australia and bounced off a couch very close to where a baby was sleeping and flew up to the ceiling, to then bounce back down to the floor. It then rolled under the television set. It was about the size and shape of a loaf of bread. Another one in another place crashed through the roof of a car garage and destroyed the back seat of the car that was in the garage. One other time, one whizzed past a golfer. It was the size of a baseball. Then there is also the case of a woman who got badly injured and burnt by one that fell on her leg and hip. Now, of these five instances, seeing these people saw and perhaps heard the sound of meteorites flying in the air, while no professor or teacher of physics or of geology ever have, who would you say is more of an authority on what are meteorites or what a meteorite could look like? Would you not say it would be the actual ones who almost got killed by one, than those who only have theorized or conjectured about what a meteorite might look like? In other words, if you had the chance to speak in person to one of the victims or near victims of falling meteorites, would you rather speak to him or to a person who has never had such an experience? If you chose the former, then the latter may not really be the ones to whom we should seek for advice. Until just lately, no scientists or lay person has been known seeing a spherical meteor that landed intact and close enough to the one sighting it, to be easily found. Because of this, geologists do not even know that there are such things as spherical meteorites except as very small grains of spheroids called chondrules. There are actually, quite a few large spherical meteorites that have been found throughout the world. Some are small like little grains of the chondrules to one that is about nine feet (three metres) high and even “more than 11 feet” but the geologists have been told by their predecessors or instructors that they do not exist, for to them, as spherical rocks are not meteorites, then any spherical rocks of any bigger size than spherical chondrules do not exist. This writer has been told or has read that spherical rocks are rock concretions (like concrete) which grow out of the ground, gradually form in river beds, are made by mankind [meaning ancient aboriginals because none today have ever been known to make any] or were formed in glacial ice deposits. This is in spite of numerous meteorite craters that are almost perfect circles. Note that the craters are not square shapes or rectangular but are mostly circular. Most likely the front parts of all those meteorites were also round, as well as the back or top parts of them. The large craters were very likely all made from falling spherical meteors, spherical comets, or asteroids. To this writer though, asteroids would never be spherical because they are the results of collisions in space. Upon looking at the craters on our moon and on the satellites of the other planets and on asteroids and comets, they all suggest that the objects that hit them were in the majority of cases, spherical. Why? Because of the circular indentations that were left on their surfaces. The satellites or moons that circle many of the planets are simply very large meteors or planetoids that got caught by the gravitational pull of their respective planets and went into orbit around them. These same meteors or moons were part of, most likely, the same mass coronal ejection that happened thousands of years ago, which sent the ten listed ten comets into space of which this book is about. There was very likely a much smaller mass coronal ejection after the crucifixion of Jesus of Nazareth, as mentioned earlier. At that time though, there would have been just small objects like short period comets, because there was no noticeable difference that was ever mentioned, as far as this writer knows, of any changes in our Solar System after that event. Why have the geologists not realized the true origins of the spherical rocks? Could it be because they themselves have never seen one fall out of the sky, nor have they known any credible witnesses that have seen one do so? It is also perhaps, because none of the geologists are very knowledgeable about astronomy. Then again, the astronomers do not seem to realize the real origins of spherical rocks either. The geologists, not having seen any spherical rocks fall out of the sky themselves, have therefore come up with fanciful names for spherical rocks and absurd ideas as to their formations, from being made by aboriginals or natives, to having been formed right in the ground that way or by water erosion. The last one is not really an absurd one but this writer has checked almost-dried-up river beds and creek beds in stony areas and in fields of hundreds of rocks in his neighbouring farm areas and could never find one spherical rock. Many rectangular ones with the edges rounded off but never a spherical one. As no spherical rocks have ever been found partially made in any quarries of the ancient world, while statues of gods or of other things have been found, suggest that spherical rocks must have been made naturally by some natural forces rather than man. We drove to the ruins of the old mine headquarters, then climbed on foot to an elevation of about 6,000 feet. There, atop a mountain spur, lay the five spheres [in Jalisco State, in West Central Mexico]. Three of them were half buried, the fourth, washed clean of rubble, stood in an arroyo, and the fifth perched on the top of the ridge. It had a bulge on one side, and it was split in two, as if broken while being shaped and left incomplete. All appeared to be made of soft volcanic stone similar to the mountain itself. The following morning we began digging out the three half-buried spheres and in their vicinity found six other buried ones. We discovered 11 more large stone balls the following day, bringing the total to 22 at this site. They varied in diameter from four-and-a-half to six-and-a-half feet. On the flat excavation area someone, sometime, had built a small rectangular foundation of stones. We could not determine its age, but it seemed an ideal spot for a ceremonial site. I was nevertheless bothered by the fact that we found not one fragment of pottery or any other artifact indicating human occupation. And the spheres, though almost perfect in form, did not exhibit the fine surface finish of the Costa Rica specimens. On the third day Jesus Lopez straightened up from his shovel and asked why we were doing all this digging and mapping. Still another site? I was sceptical at first, but decided to investigate. We arranged for horses in the village of Tiro Patria below the old mine entrance and set forth. A two-hour ride took us up a mountainside throughforests of oak, pine, and acacia with inspiring views of distant valleys. As the ground level[l]ed off at the wild and lonely crest of the Sierra de Ameca, stone spheres came into view. First they appeared singly, then in clusters where they had accumulated in small arroyos—more and more, until we estimated there were hundreds. A spectacular sight! The scene suggested some giantʼs bowling alley or the ball park of the Aztec gods. The spheres lay fully exposed; they ranged in diameter from about two feet to one giant of more than 11 feet. The average I estimated at five or six feet. The profusion of stone balls at Agua Blanca completely changed our concept of their origin. Such great numbers surely indicated natural formation. Some of the stones were pear shaped and a very few were joined as twins or had a dumbbell shape, and these sports certainly also to deny human fabrication. But if the spheres were not man-made, then how had they been formed? Where had they come from in such fantastic numbers? We realized that our expedition had made an astonishing discovery—but that the explanation for it would have to come not from an archeologist but from a geologist. It was not until 1967 however, when Matthew Stirling and his colleagues saw hundreds of spheres littering the ground at Agua Blanca, near Guadalajara, in Mexico, did they suspect that the origin of the spheres was a geological rather than an archaeological problem. Stirling's report to the National Geographic Committee for Research and Exploration resulted in a joint National Geographic - Smithsonian Institution - United States Geological Survey expedition to the Agua Blanca area in 1968. The members of the expedition concluded that the spheres were indeed of geological origin and had probably formed by the nucleation, at high temperature, of glassy material around individual, widely spaced glass shards, within the matrix of an ashfall tuff. The tuff was formed during an episode of Tertiary volcanism. Hot gases were released as the glass solidified, permeating the rock in all directions and remelting the surrounding material to form the spheres. The process of sphere growth continued until either the rock had cooled sufficiently or the spheres coalesced. Spheroidal structures are not uncommon in rocks, especially those of volcanic origin, but most are the intermediate products of weathering processes and not normally perfectly round. Many geologists will have seen examples of onion skin weathering in the dolerite exposures of Scotland's Midland Valley and structures of this type within igneousrocks appear in the literature, from as far afield as the Karroo, of South Africa and Klondyke, Arizona. What is uncommon about the stones of Central America is the near perfection of their spherical form. Perhaps the master stonemasons of that unknown culture first credited with making them, simply honed to perfection the spheres they liked best? The presence of millions of tons of finely pulverized silica, which could only have been created by enormous pressure. The large quantities of meteoritic iron, in the form of globular “shale balls,” scattered around the rim and surrounding plain [regarding the Barringer circular Meteorite Crater in northern Arizona]. See what it looks like at http://www.barringercrater.com/ and at http://www.amusingplanet.com/2013/07/the-incredible-barringer-meteor-crater.html. Note that seeing the Barringer Crater is mostly circular, does this not suggest that the object that made that crater was also quite circular or spherical? Part ii., vol. Iv., of the Smithsonian Miscellaneous Collections (p. 203, No. 1725) contains an interesting illustrated discussion of the Canyon Diablo meteorites, by Messrs. G. P. Merrill and Wirt Tassin. The former discusses the distribution and physical characters of the shale balls found in such large quantities in the vicinity of the canyon in Coconino County, Arizona. These balls are roughly globular in outline, of all weights up to 50 lb., and consist of an exterior coating of hydrated oxide of iron frequently enclosing unoxidised iron centres, or nuclei, the intermediate shell showing a green hydroxide of nickel mingled with oxides of iron. The inspection of a number of these balls and of the ground in which they are found apparently strengthens the theory of the meteoric origin of the crater [Barringer Crater]. Mr. Tassin deals with the chemical analysis of the finds, and shows that these shale balls differ to some extent in their chemical composition from the ordinary Canyon Diablo iron. They contain appreciable quantities of chlorine, whereas none has been found in the ordinary iron, and also contain more phosphorus; to the presence of these two elements the increased oxidation of the shale balls may be ascribed. Others believe natural forces may have caused the creation of the spheres. One of the two prevailing scenarios envisions huge chunks of molten rock ejected into the air millions of years ago when the Talamancas were an active volcanic chain. The ejecta then took on a spherical shape as it cooled in its fall to earth—much like a raindrop does. Another article on globular rocks can be found at this site: http://www.sciencedirect.com/science/ article/pii/0024493793900177. It is about a find of Globular ferropicritic rocks at Pechenga, Kola Peninsula Russia. During the last several years, a number of planetary systems have been discovered by astronomers. One can find many sites on the internet of such things, such as “theplanetary.org.” Two scientists even saw one apparently being made, as reported by space.com around 2003. It was a so-called dwarf star, about the same size of ours, ejecting a huge amount of mass, sufficient enough to cause a planetary system like ours. It was previously thought that our Sun was too old, cool, or too small to be able to bring about a planetary system. This theory has therefore been proved wrong. This is because when molten mass goes out into the vacuum of space, they naturally form spherical-like objects, provided that most of its composition is of the same or similar weight or specific gravity. A similar thing happens when mercury, which is always in liquid form at room temperature, is spilt on a smooth surface. It breaks up into small bits of spherical ball-bearing like structures, running all over the place. When this author saw this happen, they were about 1/8 inch (3-4 mm) in size. If any of the molten blobs and spittle of matter that get ejected into orbits start to rotate, and apparently most, if not all do, they expand a little at their equators while they are hot, just as what has happened to the Sun and to our planet Earth. This phenomenon is another reason why some of the spherical rocks are not exactly spherical, for one was found in a similar shape to a watermelon. It apparently got blasted from the Sun in a molten blob or shape similar to that of a rugby ball and most likely, only spiralled about slowly, about its longest axis. Another thing to note about many meteorites and especially the spherical ones is that the cores of the meteorites are not always of the same exact composition as on the surface. So when the hot heavier core cools and shrinks, the outside crust of the meteorite will often fold in creases, in similar fashions as to what happens with pie crusts and cakes, when they cool off. They wrinkle and you will see that this is the case in the three large meteorites in our photos. Sometimes cracks will even occur as happens with concrete, if it dries and sets too fast. So in space, similar things must also happen. You will also see evidence of some kind of gas, vapour, or liquids, having bubbled out and escaped through holes on the surface of meteorites as they were ejected into space and on into orbit. These kinds of escaped matter would then form little dried up river beds on the meteorites. While some blobs of a dense like soup of all kinds of elements and molecules of matter that were boiling in the sun’s molten rock were flying off into orbit about our Sun, the heaviest elements would very likely be in the centre of the molten mass while the outside lighter elements get cooled off first. At times though, lighter elements or matter gets trapped in the centre core and later bubbles out or bursts out and causes structures like little volcanoes, vents, creases, and air holes on the outside surface as it cools. Look for some of these signs in the following photos of our samples of meteorites. Some though may have been weathered for years before anyone found one. These therefore may lack signs of the air holes on most, if not all of its surfaces. In the light of the above explanations, please consider with due thought and reasoning, the following remarks and discoveries. As our theory is that all meteorites were originally from the sun thousands of years ago and that some may have come from an asteroid belt of debris from objects like comets or small planets or moons which once collided. Since they too came from our Sun, please look at the following photos for signs that the spherical rocks were at one time molten masses from our Sun as well. If they were from the Sun then there should be signs of cooling, of water or other material, coming out of the cooling crusts and causing vent holes, creases, and appearances similar to that seen with bread dough, pastry, and cakes as they cook with water and steam escaping from them. Then while cooling, there will sometimes be areas which will collapse and cause wrinkles, creases, valleys, and hills. A short while ago, when this writer’s brother and sister-in-law were in Chile, South America, they were startled one day upon hearing a loud crack in the day time. A formerly cold rock suddenly got so hot in the daytime sunshine that it split apart into two or more pieces. This helps us to understand the nature of how rocks have been splitting up and breaking down for centuries, thus providing material for our soils for plant growth. This also explains why more spherical rocks have not been found in certain areas. Random House Webster’s Unabridged Dictionary, 1999. One AU is the average or mean distance that our Earth is in its yearly trips around the Sun. One Astronomical Unit is about 93,000,000 miles or 148,800,000 km. A reprint of the English translation (from Hebrew) edition originally published by M. M. Noah & A. S. Gould of New York in 1840. This author’s essay on the Chronology of the Old Testament, ca. 1976. Hear playback of the program by going to their website: www.thepowerhour.com. Time Almanac 2010, p. 130. Random House Webster’s Unabridged Dictionary. Containing all the elements in that area and that are found on all meteorites. This could be a sampling of every element that is now swirling around on the Sun and that has been found on the Earth, if the Earth is made up of the same dust cloud that formed the Sun as some say or if it came from the Sun in a past explosion. Patrick Moore and John Mason, The Return of Halley’s Comet (W. W. Norton & Co., New York, 1984), [worked out from their information] p. 46. Time Almanac: 2010, p. 130. These quotes and facts are from NASA Facts: “Our Prodigal Sun” KSC 116-81, Revised April 1982. C. Besson’s 2005 essay: The Real Year of the Double Dawns of the Reign of King Yi. Matthew W. Stirling, National Geographic Magazine, 136: 293-300, August 1969 (This article was found in copied pages E1-118-119 of an untitled book given to this author several years ago). Article ERB-008 The Canyon Diablo Meteorites, Anonymous; Nature, 77:208, January 2, 1908. This article was given to this writer as a page out of an unknown book on a chapter on Anomalous Rocks ERB-008, p. E1-119. The included photograph section has photos of one spherical rock found by Constable Paul Sutherland of Camperville, Manitoba; another one about the same size by Mr. Gordon McKay of 180 McKay’s Point Road, Pine Creek First Nations, Manitoba (about one or two kilometres away from the first one); pieces of another one by Trecia Bersi (formerly of Camperville area) and her friend Mr. Fred Geekie, (also formerly of Camperville area), and a very large one by Mr. Peter Lysiuk of Winnipeg. It was a Mr. Ronald Chartrand (about forty years old at that time) who first reported to the above-named constable of seeing a meteor going across the sky over Camperville during the early morning hours (about four a. m.) while dogs howled all over their village in the spring time, possibly in April 2000. It was seen going slowly across the sky and then falling into a forested area on the outskirts of Camperville but within the village limits. Sometime that same day, when Constable Sutherland was told about the falling object, he found it in a large field across the west side of the road from where he used to live as a child and where his mother still lives (at the time the rock fell out of the sky). As a child, he and his neighbours never saw that rock in that area before. It is next to a forested area. After hitting the ground on a slant, it bounced about twenty feet (six meters) away out of the dent it made on the frozen ground and then rolled to a halt, about seventy-five feet (22.8 meters) away. As it rolled it made a furrow in the ground and it got deeper as it slowed down to a stop. The meteorite, being the size of a regular beach ball, was fairly easy for him to find, as it fell onto the snow-covered ground in a large field near the edge of a forest. It apparently got quite dirty when it hit the snow covered fertile grassy soft ground, as it was quite black and multicolored when he first found it. Sutherland thought it was too heavy for him to lift, so he left it there for a week. He then asked his son Clayton (about fifteen or sixteen years old at the time) to get some help to somehow bring the strange rock home. He did so with his friend Tony Korchinski with a trailer and an all-terrain vehicle. Since that time, the Sutherlands washed some of the black debris off of the stone plus it was out in the rain, sleet, sun, and snow for years before this writer examined it. Around the time that the constable found the rock, he was afraid that someone might want to steal it, so he hushed things up about finding it. Mrs. Susan Bone, who lives close by, found out about Paul finding it. She therefore informed this writer on Saturday, April 24, 2004 (115th day) about it, when he was sharing his interest in comets and meteorites. The rock was found to be about fifteen inches (38 cm.) in diameter, 162 pounds (about 73.5 kilograms) and having a specific gravity of about 2.42. Geologists said this stone is mostly a granite rock concretion and was most likely man made. On moving a compass close to the rock, the arrow was deflected, thus showing there is iron or nickel in the rock. Geologists, astronomers, and one instructor at the Brandon University in Brandon, Manitoba refused to believe that this stone and another one were meteorites. So this author went about the area where the rock was found by Paul Sutherland and sought for other witnesses of this rock falling out of the sky. This was in the spring of 2005. On going door to door across Highway 20 in Pine Creek First Nations on the north side of the field where the spherical rock was found, this writer met a Mrs. Annette Nepinak who said that she and her son Randy (fifteen or sixteen at the time) had also seen it falling into the field one night, possibly in the spring of the year 2000. They said that it was a greenish falling star or meteorite that just plummeted down into the field one night. The Nepinak house faces south and they saw this event through their living room windows (their address is House 10 on Highway 20, Pine Creek First Nations, Manitoba). Later that same evening of visiting the above people, a Mrs. Mildred Catcheway of House 705, Duck Bay Road in Pine Creek First Nations, said she saw a greenish falling star or meteorite fall that night in the same general direction of that field. Mr. Allen Sutherland, Paul’s brother, heard about the meteorite that was found. He later went to his brother’s place at 205 River Road, Camperville, Manitoba to examine it. Mrs. Susan Bone who lives just down the road from Constable Sutherland’s place, said that everyone in Camperville knew about that meteorite falling into their area that particular night. She just did not know that according to geologists and astronomers there is no such thing as a spherical meteorite. So according to them this was a none event, that is, it did not really happen. School teacher Zelda Chartrand, sister of another Ronald Chartrand, said she remembered hearing her brother mentioning about a meteorite falling into Camperville one night some years ago. One of the teachers at the Minegoziibe Anishinabe School, Maryann Simpson of Camperville, Manitoba wrote “I heard the story about the meteorite: It landed in a field (somewhere) across the highway [#20 to Cowan, MB] from Thomas Nepinak’s place. There’s [also] a landowner who tried to say that it fell on his land and that he should get the meteorite [referring to Mr. Julien Cottyn of Swan River, MB who was actually leasing Crown land for hay for his cattle]. On 7 October 2010, this writer met a Mr. Miles Nepinak (ph. 204-524-2130) in that same area. He said that the time that Constable Sutherland’s rock fell out of the sky, he was coming back from Dauphin, Manitoba, which is south of Camperville. He saw that same rock fall out of the sky as others did. He estimated that it fell into the wooded area just south of highway 20 where a number of houses were built and are still there. He went looking for it in the bushes and woods on the edges of the field but he could not find it. Mr. Gordon McKay, who found the other one in a deep pit of clay behind the arena at Pine Creek First Nations, said that around the time that Paul Sutherland found his meteorite, a number of meteorites were seen by others. The other spherical meteorite is about fourteen inches (35.6 cm) in diameter, 133 pounds (60 kilograms) and a specific gravity of about 2.61. It was found some time ago, possibly in the summer of 1999, about eight kilometres north of the area where the other was found. The smaller one was found while Mr. McKay, a landscape contractor, was digging clay out of a pit. He did not notice the rock until starting to take away the clay that they had brought to the surface of the eight to ten-foot pit. While a few kilometres south of Camperville, a Mrs. Shirley Parenteau and numerous other people saw a light-green ball-type of meteor or comet with a greenish tail of about six times the length of the size of the object at the front. There were also sparks at the end of the tail and it was making a swishing noise as it went by. They saw this about 9:30 p. m., while they were coming home from Winnipegosis at about the end of January or beginning of February of 2005. It was the size of the moon, when it was seen overhead in the sky. As it was going slowly toward the west of Camperville, it must have also fallen into a forest in their area. It has not been found as yet, as it is in quite a wilderness area. Her husband, Chuck Parenteau and their children saw another slow-moving falling star, which was a “golden-green” colour in their area on about 3 April 2005. The bits and pieces of similar spherical rocks, as seen in the photo section, fell apart after about one year in their home. They were about six to eight inches (15 to 20 cm) in diameter when found and they had a glassy outer shell to them, which soon broke down in our atmosphere of our Earth and in the dampness and heat of their home. The reddish one that is attracted to a magnet was found by Mr. Fred Geekie about twenty years ago in the Garland area, in the first gravel pit near Boggie Creek, just before Duck Mountain Provincial Park. According to geology instructor Peter Adamo of the University of Brandon, it appears to be made of iron sulfide (FeS) with some magnatite (Fe3O4). The one with the larger black and white crystal-like pieces was found about thirty-two miles (51 km.) south of The Pas, Manitoba, in a gravel pit, on the west side of the road, about three miles before the spring water, south of The Pas. This was found about August of 2003 and it too was the only rock like it in the pit. According to instructor Peter Adamo at the University of Brandon, it appears to be made of plagiooclase feldspar (NaAlSi3O8 to CaAl2Si2O8) and pyroxene gabbro. One spherical meteorite that was found by the lady, Trecia Bersi, was light and seemingly hollow, as if it was a bubble of gas that flew off into space, with a membrane that froze solid into a tough shell as it traveled away from the Sun. This broke down too and had to be discarded after a few years. The huge three feet (about 90 cm) in diameter meteorite was actually found about seven miles (about eleven kilometres) east of Danbury, Saskatchewan, Canada in about 1970. It was found by Mr. Peter Lysiuk who lived some miles away. He was working for the provincial government, building roads at the time, driving bulldozers and other road grading equipment. He came across a large round stone one day that was protruding about one foot (about thirty centimetres) out of the ground. Upon digging it out, he found that it was quite circular and spherical in shape. He therefore kept it for a souvenir. As pointed out in a video we made of the rocks and in our photos, there are many holes and crevices that could have let out gases as it cooled and was being shot out into space and into orbit. As the inside core was probably of a heavier composition than the outside, it would shrink at a different rate than the outside and could very likely have caused the creases and wrinkles on the surface. 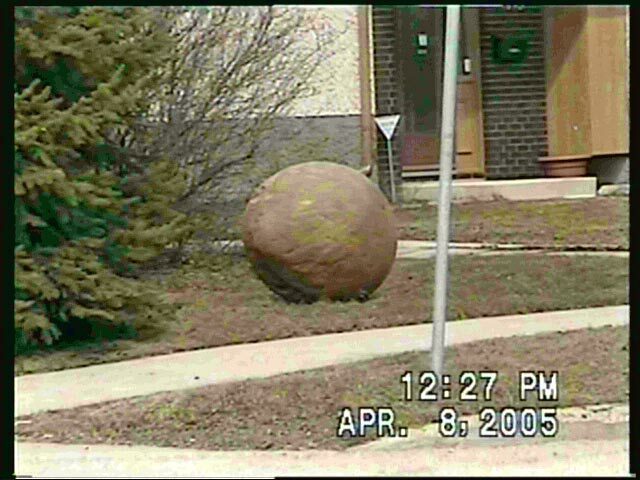 When Mr. Lysiuk retired, he later moved to Winnipeg, Manitoba, he brought his large spherical rock with him on a strong truck and placed it on a concrete pedestal in his front yard at 191 Garden Park Drive at Templeton Avenue, Winnipeg, Manitoba. There is another huge one in Winnipeg, that this author first saw before he saw the ones found in the Camperville area. The really huge one was at the side of a construction site, possibly near the forks area. It was about six or seven feet tall (about two metres high). On later looking for it, he could not find it. Apparently the contractor never knew the tremendous find he had. Hopefully, somebody reading this will remember seeing it and might know where it is. If so, please contact this writer as to its whereabouts. Though there were much indications of iron in the two smaller ones, there was no signs of iron in the three feet wide one. A John Wiebe, of Box 53, Tolstoy, Manitoba R0A 2E0 found in about 1990, a very interesting rock, which he believes is a meteorite and so does this writer. He found it on his farm while digging a trench about 6 or 7 feet (183 to 213 cm) deep in clay soil where there were no rocks or gravel. What is unusual about this one is that it is in the shape of a watermelon and is about 10 inches (25 cm.) long. A Bart and Linda Prior of Neepawa have a rock similar in size as to the ones found in the Camperville area. Their rock weighs about 168 pounds (76.36 kilograms). A Melody Giesbrecht of Altona, Manitoba sent this writer the photographs of the rock at the Gretna Manitoba Cemetery. It is about fifteen inches (thirty-eight centimetres) in diameter and was originally found in North Western Ontario. A Mr. Ben Andres of Steinbach, Manitoba lent this writer, pieces of a large spherical rock that he found at one time but through the heat and cold of Manitoba weather it broke down into many pieces. Answer: As you can see by the article Photos of Former Space Objects, there are many small holes. Some are only dents in the surface as if smaller meteors bumped into these meteorites before they landed on the Earth. It could be that the astronomer’s glasses were dirty, he was not observant or did not even want to see the holes, otherwise his schooling would have been proved wrong. It could be that to him holes are ones that are big enough to insert one’s fingers in as with tenpin bowling balls. He should realize though, that if these rocks or meteorites came from the Sun as we believe they did, then they were molten or liquid rock that even expanded to their present size as they were shot into space and got far away from the strong gravity of the Sun. While cooling off in space though, anything lighter than the rock would slowly rise to the surface of the rock, especially if they were spinning in space. Some of the lighter materials escape through vent holes that they make when coming to the surface, like little volcanoes. One of the rocks has a circumference of 120.3 cm. at its poles while it is 120.8 at its equator. In fact this difference is essentially the same ratio to that of our planet Earth. The smaller rock in one of the photos has a circumference of 110.7 cm. at its poles while it is 115.3 cm. at its equator. This may be indicative of it spinning faster than the other one while it was still molten rock. The heavy liquid would then slowly fill in the escape passage way. As the outside would be cooling off faster than the inside, marks or signs of the holes can still be seen on the surface. Some of the holes show signs of a lip of molten rock having cooled off just before it could completely close off the hole. There are actually hundreds of small holes on these two large rocks, which are similar to many of the holes on lava rock. Most of the hundreds of holes though, on examining more than one hundred photos of the two large spherical rocks, seem to be vent holes or holes where vapour or liquids escaped to the surface of the rock. There are possibly two or more places where the liquid may have been iron that came to the surface, like a little volcano but as with many of the other holes or bubbles, the iron was kind of burnt off as it entered our atmosphere. 2. Question: Are there not signs of worms crawling on the surface at one time? Answer: There are similar marks on the spherical rock at Templeton Avenue and Garden Park Drive, but they too are very likely from the teeth of heavy equipment which was used to lift it out of the ground. Later it was transported to his property in Saskatchewan and then later on to its pedestal in Winnipeg, Manitoba. The one from Pine Creek First Nations has similar scratches or gouges, which probably got there from the back hole that was used several times on it to get it out of the clay pit, onto a truck or trailer, off the vehicle and onto a large boulder for display purposes. People at times would even knock it off and then it would be put back up on it again and again until the owner finally just left it on the ground near the large boulder. 3. Question: How come it is so different from the other meteorites? Answer: One should realize, that at one time our planet Earth was quite similar to these meteorites for it too was a huge molten rock flying in space. As it revolved it got bigger at the equator because of the centrifugal force of trying to send everything away from the center of the Earth. As the surface of the Earth cooled, it became one huge spinning spherical rock with a greater diameter at its equator than at its poles. As there was constant heat and cold as the Earth went into orbit about the Sun and continued for thousands or millions of years of circling the Sun, the rocky surface cracked and cracked, and weathered so much that eventually there were enough dust and soil for plants to grow. Furthermore, just as our planet Earth is made up of about 105 different kinds of elements and hundreds or thousands of compounds of these same elements, so we should expect all the space rocks that have fallen and will be falling from the sky in the future will be of similar elements and compounds, except for those due to biological formations of plants and animals. These same plants and animals are made out of the same elements or substances as can be expected to be found on any object that came from the same parent star, that is, our Sun as did our planet Earth at one time. 4. Question: If your rocks are from space, how come we do not find many or hardly any of them? Answer: As noted in the above chapter; some or maybe even most spherical meteorites start to deteriorate from the moment they enter our atmosphere and fall on the ground. If brought in doors, they may be slowed down or even deteriorate faster, depending on what substances they consist. Even the big ones like our main two meteorites start to crack apart and will eventually split apart if left in the sunshine or in the freezing cold. The one that fell onto the clay soil was spared some deterioration until it was put on display. The one that fell onto the prairie soil of Saskatchewan, sunk into the soil enough so that it helped prevent it from completely cracking to pieces in the hot sunshine. 5. Question: How can we tell whether what you are saying is true? Answer: You do not have to believe me but just use common sense and basic physics and your faculties should tell you that what we have been told by those who should know, does not add up or answer all the properties that can be seen on these samples of rocks. You can also phone Constable Paul Sutherland and his son Clayton of Camperville, Manitoba (204-524-2392 or 2270) and the Mayor of Camperville (204-524-2212) plus Mr. Gordon MacKay of Pine Creek First Nations (204-524-2262). You may also be able to track down Mr. Fred Geekie who may have moved back to The Pas, Manitoba. 6. Question: Since Fred Geekie claimed he found his spherical rocks in gravel pits, does that not prove they were formed naturally on the Earth like the other stones and rocks in the pits? Answer: No! If one considers the difficulty of ever finding a spherical rock meteorite in a hay field, prairie grass land, or a forest in comparison to finding one amongst stones and rocks in a gravel pit, what one would you choose? Would it not be vastly easier to find one in a gravel pit than in other places such as in lakes? After several years in a field or forest, the spherical rocks would probably breakdown and become part of the soil or would soon sink too deep into the soil to be ever found before it would breakdown and become part of the land. If Mr. Geekie had not found his spherical rocks when he did, it could be that they too would have cracked and deteriorated as quickly as the ones that fell on other areas of the land. As he was observant at looking for unusual things, he found his first one and after that he would be constantly hoping to find another. That is why he found them in the gravel pits. During many years of travelling in the country, shovelling gravel and dirt, and being at beaches, this writer has never noticed spherical rocks of any size like the ones mentioned in this book, except for one huge one in Winnipeg. He did not realize what it was though and neither did the ones that found it, otherwise there would have been a big news article about it. One time though, he found an aboriginal sledge hammer or mallet head amongst some gravel at an Auto Wrecker on Springfield Road in Winnipeg, some years ago. Figure 1 on the front cover of this supplement (Chapter Two) is the first spherical rock that this writer was told about and examined. This was photographed in the back yard of the one who found it around the year 2000, in the spring time (March) while the ground was still frozen in a field a short distance away, where he used to play as a child. Note all the vent holes and folds, as one would expect if objects like these were ejected as molten rocks into cold space at one time. Photo 2. Arrow is pointing to a measuring tape that was used to find the circumferences and to indicate the size of any crevices and small dents or holes in the rock.